Make sure you are working with professionals when it comes to fixing or replacing your home's HVAC systems. 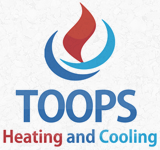 Toops Heating And Cooling are professional contractors who work hard to provide you with the best HVAC service available, letting you be prepared for whatever temperature the weather throws at you. You deserve to know that your comfort is in good hands, which is why it is important to hire the services of qualified HVAC professionals. At Toops Heating And Cooling, in Columbus, Ohio, our team of experts sees to it that all your home's air systems are working properly. With our knowledge of all makes and models of furnaces and air conditioners, you can rest assured that all repairs and instillations are handled correctly. With more than 30 years of experience in the field, our team has the knowledge to address any issue. You also get the peace of mind knowing that our locally-owned-and-operated business is built upon the honesty and integrity that has fueled our success. With our 100% customer satisfaction and reasonable prices, you'll know why we are the AC company of choice for your home.